If you enjoy bushland, views of the mountains, an adrenalin kick from a very long downhill stretch and the great sense of the serenity that comes from being away from the city, this is the ride for you. It follows the Murray to Mountains rail trail from Beechworth to Myrtleford. The ride starts at Beechworth Station (no longer in use) in the midst of one of Victoria’s loveliest historic towns. You first follow the old Beechworth-Everton railway line to Everton, passing several historic stations on the way. Shortly after the start, there is 16 km of freewheeling through peaceful bushland taking you to the intersection with the old Wangaratta-Bright railway line. Everton Station is a side trip of about 350m from this intersection. The ride continues from Everton to Myrtleford on the Wangaratta-Bright line. The first part of this section to Bowman Station is easy riding with great views of the surrounding countryside including the spectacular Mt Buffalo. After Bowman Station there is a long steady climb to Taylors Gap. As the gradient is not too steep, the climb is easily conquered by engaging a lower gear and pedalling steadily to the top of the hill. The final few kilometres of downhill and flat riding into Myrtleford is particularly spectacular in autumn when you can enjoy the wonderful autumn colours alongside the Snow Road. There is no public transport that takes bikes to the start or end of this ride. However trains run to Wangaratta each day and there are private operators that will transport you and your bike for a fee. Alternatively, you can do a car shuffle. See Murray to Mountains Rail Trail for more information about the rail trail. Carry extra water as there is nowhere to fill up your bottle. There are cafes in Beechworth and Myrtleford. There is also one in Everton about 1km from the trail. Just ride down Diffey Road to find this. We stopped at Gapsted Winery near the end of the ride for lunch. This restaurant has spectacular views across the nearby hills. There are toilets along the rail trail. The ride is on sealed rail trail. There is one uphill section and the rest is flat or downhill. Gradients are limited as this is a rail trail. There is no public transport for bikes to the start or finish of this ride. So either bikes need to be transported by car with a car shuffle, or you can catch the train to Wangaratta and hire one of the bike transport companies to take you to the start of the ride and pick you up at the end of the ride. Start at Beechworth Railway Station next to Railway Avenue in Beechworth. 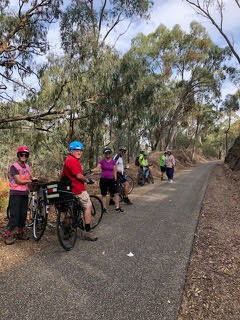 Ride south east for 16km along the Beechworth-Everton section of the Murray to Mountains rail trail to the intersection with the Wangaratta-Bright section of the Murray to Mountains rail trail. Turn left onto the Wangaratta-Bright section. Follow this for 26km to the outskirts of Myrtleford crossing Great Alpine Road twice. Just before you reach Myrtleford the rail trail follows Great Alpine Road before bending away from the road gradually. The trail turns sharp right to head back to the road along Barwidgee Creek. Instead of turning left with the rail trail, continue straight ahead on the side trail going beside Barwidgee Creek and under Great Alpine Road. Rotary Park is on your left. This ride can be combined with other segments of the Murray to Mountains Rail Trail. The Beechworth Everton section can be done as a side trip of the Wangaratta Bright ride.